Eduardo Martin, born in Havana on October 16, 1956, is an internationally recognized guitarist and composer. He has been a guitar professor at the Instituto Superior de Arte in Havana, the most important art school of Cuba. Since 1991 he has successfully toured Cuba, South America and Europe giving concerts and master classes with great acclaim from both critics and the public in general. He is a regular adjudicator on international competitions. His compositional output includes a large number of works for solo guitar, as well as duos, trios, quartets, chamber ensembles and soloist with symphony orchestra. He has also written incidental music for theater and cinema. He is one of the most sought-after composers of the contemporary guitar, his works have been performed and recorded by many renown artists throughout the world. 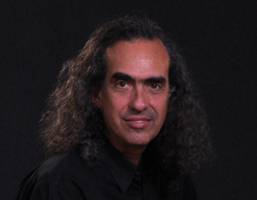 His works have been published in Argentina, Cuba, Mexico, Uruguay, Spain, Japan, Switzerland, Costa Rica, Canada & USA, and have also been an integral part of the repertoire in the academic guitar programs in many countries. 2017 – Tours in Spain, UK, and the U.S.A.
2016 – Tours in Spain and the UK, including a master class in the Guildhall School in London. 2015 – Tours the UK with guitarist Ahmed Dickinson Cárdenas. The Dockland Sinfonia performs the world premiere of his double concerto “Mestizo” in London. 2014- Tours around Spain and performs for the first time in the UK. 2013 – Performs in Hans Werner Henze’s El cimarrón when staged for the first time as a chamber opera in Havana, Cuba. 2012 – Established the Eduardo Martín Ensemble, making TV and Radio appearances in Germany including a concert in Bad Aibling International Guitar Festival. 2012 – Tours around France and Cataluña. 2012 – Performs at Festival Internacional de Guitarra de Costa Rica. 2011 – Taxco Guitar Competition and Festival, Mexico, is dedicated to Eduardo Martin. 2010 – Sachiko Tanuma’s documentary “Cuba sentimental” is released in Tokyo, with soundtrack written and performed by Eduardo Martin. 2010 – Establishes En Confluencia, a popular music residence in Casa del ALBA Cultural, Havana. Conservatorio de Sanlúcar de Barrameda, Spain, organises a concert dedicated solely to his works. Invited as a guest to “Pa´lo escrito” Festival by The UNAM (Mexican Autonomous University). 2009 – Produces Alter Ego trio’s CD Sones y Flores. The CD is nominated to CUBADISCO 2010. 2008 – Records the second album anthology of his music with GSP, USA. 2008 – Features and performs respectively the documentary and the CD “Elogio en Espiral” producedby Leo Brouwer and Rosa Matos. 2008 – The Costa Rican University organizes a concert dedicated solely to his works during the “Guitarra en Occidente” Festival. 2007 – The prestigious label GSP released “Angels in the street”, the first album in a series dedicated to his works. The CD’s critical acclaim has been noticeable crediting Eduardo’s music amongst the finest in the contemporary guitar literature. 2006 – Antonio Levesi Cervi’s documentary Argentina tierra de guitarras is released featuring Eduardo as composer and performer in the sound track. 2006 – In Casa de las Americas, establishes an annual cultural event called Viaje a la Guitarra” (Voyage to the Guitar) where prominent Latin American artists perform. 2006 – Awarded lifetime achievement recognition by Cali Fine Arts School, Colombia. 2005 – Establishes Duo Martín with guitarist Galy Martín, his daughter, in Cuba. 2004 – María Crusellas’ documentary Construcción de una guitarra is released in Buenos Aires, Argentina with the sound track composed and performed by Eduardo Martin. 2004 – Establishes a duo with flutist Jesús González and records the album Lugares Comunes for GEMECS label in Cataluña, Spain. 2003 – The “Concours International de Guitare Ville d´Antony” in France dedicates the entire competition to the bulk of his work. 2003 – His works “La Trampa” and “Hasta Alicia baila” are nominated to Best Classical Album categoryat the Grammy awards in the L.A.G.C. CD “Latin” by TELARC label. 2000 –Costa Rican School of Guitar organizes a concert dedicated solely to his works. 1999 – Is chosen by the NEW YORK “American Composer`s Orchestra” to be the guest composer at Sounds of the Americas Festival. 1995 – Establishes Cuarteto Imaginario with Francisco Gamallo, Ignacio López y Walfrido Domínguez in Spain. 1991 – Becomes the first Latin American composer to win Radio France International Guitar Competition. 1990 – Establishes the Dúo Confluencia with Walfrido Domínguez in Cuba. 1988 – wins three prizes with Guitarra 4 Quartet at National Chamber Music Festival, sharing two categories with Exaudi Choral and Entre Voces Choir. 1987 – Establishes The Guitarra 4 Quartetin Cuba with Rey Guerra, Carlos Lloró and Walfrido Domínguez. 1985- graduates from Instituto Superior de Arte de Cuba and wins a post as a soloist in Centro Nacional de Música de Concierto.